In my consulting practice I do a lot of work with software and hardware companies in area of channel development. One of the hardest things to manage while growing a channel business is the inevitable conflict between all the players throughout your various distribution methods, including your direct sales force. 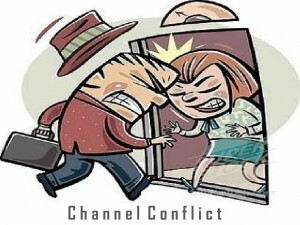 Of course, my colleagues in the channel might say you can limit this conflict by using the channel exclusively. That is the nature of channel conflict—all parties want the business for THEMSELVES. Much smoke is always blown by the various interested parties about what is right and fair, and commitments that were made and so on, but let’s face it—it’s basically self interest. They just want the business for themselves. So what’s a company to do? Just sell direct, or just sell through a single, dedicated channel such as VARs or retail? Unless you have strict exclusive territories throughout your distributions system, even if taking this approach problems will still arise. You’ll always have some kind of conflict (two direct reps or two resellers fighting over who should have an account), but at least you would eliminate cross-channel conflict, which can be particularly complex and nasty. Limiting yourself to a single channel focus certainly may make your life less complicated and less rife with conflict. But unfortunately, in most cases, you’ll be leaving a lot of money on the table. If you rule out any natural channels that can sell your product you won’t be maximizing your return on your heavy investments in product IP — which should be one of the fundamental concerns of any business. So I say: sell through every channel that makes sense. If done poorly, it can and almost certainly will be very messy. You’ll be sorry you did it and probably become a convert to a single channel or at least less complex distribution model. But it doesn’t have to be so. Yes, you CAN have your cake and eat it, too. It actually sounds pretty simple and easy. Yet humans can be greedy creatures and just a little greed in partnering can quickly ruin reputations for a long time. There’s the greedy VAR who thinks he deserves a piece of every deal with any customer within a 500 mile radius of his office—a customer he might have only sent a piece of mail, or cold-called a year prior with no further contact. Just as seriously, it only takes one weak-willed sales manager at a manufacturer or software developer trying to make quota or maximize his income, to cause real havoc. If he attempts to cut a channel partner out of a deal that they drove, or had legitimate influence on—this is a mortal channel management sin. Your channel partners will be outraged, and they will spread the word and not soon forget. Your reputation has been tainted, and that crucial trust that is necessary to make any business relationship work is now gone. Everything becomes harder. Partners become unwilling to share information about what’s going on in accounts—maybe even withholding names on potential new deals. A struggle for account control, rather than teamwork, becomes the rule of the day. So if it is a REAL partner, one who is trying to drive business to your mutual benefit: do whatever it takes to make it right. Give up short-term profitability to maintain a long-term profitable relationship. Don’t ever, ever screw a partner in the name of short-term gain. It can damage or even ruin your channel business for the long term. If you are honest and fair with partners and sales employees, potential channel conflict shouldn’t unnecessarily stop you from maximizing revenue by using multiple methods of delivering your product to the market. There are a range of customer profiles in almost any market. Some prospects want to buy everything through their trusted VAR/Integrator, who helps give them a somewhat independent third party evaluation of the product’s virtues. Others want to only deal directly with the manufacturer or developer of the specific product they are purchasing. A third category of buyers likes to buy as much as possible through their favorite large manufacturer—this is a great reason to OEM your product to the IBMs, etc. of the world. In each of these situations, the channel that is best positioned, via relationship or type of support, should and usually will get the deal. If your product isn’t available in that particular channel that the customer prefers to buy through, you may NOT get the deal. The last category of buyer, however, is different. This is the bargain basement buyer, the one who couldn’t care less who he buys from, as long as he gets the lowest price. These are the people that can wreak havoc on a multichannel distribution system, if you aren’t careful in how you structure your channel business. 1) Tell your value-added channels that this price conscious buyer, who isn’t looking for any added value, isn’t going to buy from them. You might decide that this buyer is going to find the lowest price at retail (if that’s one of your channels), or maybe direct if they buy in volume. In this case, it’s important to set those expectations up front when you recruit channel partners. Let potential partners know where they fit and where they don’t. They can walk away if they don’t like it; otherwise they’ve been warned. This is being fair and honest. Before potential partners invest in selling your products, they should have the real picture of what they’re getting into. 2) Conversely, you should also strive for street price equity between channels. This gets tougher to do the more channel types you have and also the larger your channel is in general. But it can be done if you work at it. The main point here is to avoid giving incremental channels discounts based upon volume. If you do, incentives are created for a channel player to discount heavily to achieve volume—thereby lowering their costs, enabling them to win more business via even more aggressive discounting. This leads to a continuous downward spiral in your street price, and to unhappiness and channel conflict to such a degree that will drive you to drink — or at least a career change. It can get very ugly. But if you limit your channels to those that truly are value-added in some way for your product this situation can be managed. The key is to set partner discount schedules based upon value-adds and their associated costs, rather than revenue or unit volume. So there you have it. Sell through all the channels your product belongs in. Be honest and fair with you partners. Strive as much as possible for equity in street pricing between partner types. Sounds pretty easy to me–of course it isn’t! Add your own thoughts and stories on selling through multiple channels and managing potential conflict. Post a comment below to add to the discussion. Good, solid thoughts. I would add that one should also ‘allow’ or expect value-added channels to use other suppliers. The challenge here is that if your company is truly ‘best of breed’ then you should expect this to seldom happen. If it does, then pay close attention because if the channel chose something other than your (similar) product find out why – there may be attributes you need or want to improve! Thanks for the feedback. Nice addition to the discussion. The one area that wasn’t covered is lead distribution, which in the end, can be the key to a successful channel mgt strategy or a nightmare! I think you have summed up the issues very succinctly. Matt’s addition of lead distribution / management is also very important. We have seen vendors really struggle over this point, almost to the point of failure. We are seeing, that in this economic climate, the problem described in Point 1 is becoming more prevalent. We work primarily with vendors, but we have a couple of clients who are resellers and they have suffered a great deal from short term target management by their suppliers – none of whom are our customers I hasten to add! Another point is too evaluate your channel from a technical perspective. See which channel partners offer technical support to clients and which offer a preceived support (The reseller tells you how great the service, but the clients tell you it’s not adequate). Every reseller will tell you how great their services are, but as a developer, you need to test a resellers ability. What I did was have different levels of resellers by technical ability for each product. (i.e. A reseller can by proficient on services and support on Product “A”, but not product “B”. In that case, the reseller would get a higher commission on product “A” and either a small Finders Fee or no commission on product “B”. That opens up the door for strong support and services in all your products, since the manufacturer or another reseller can provide the service and support for product “B”. One other consideration is compensation of company sales management, particularly at the executive level. It should be structured so that it aligns with aggressive closing of deals, but in a way that does not favor one path to market over another.